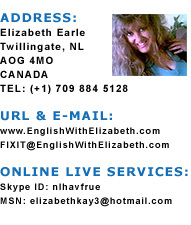 English With Elizabeth › Idioms - Idiosyncrasies or Idealisms? There are idioms alive and well in all languages, but sometimes I wonder why they are so popular to begin with. Why do we need to twist our words so the meaning is applied to something completely nonsensical and has nothing to do with what we are trying to say? Are idioms more of a personal idiosyncrasy and used by the more flamboyant of society? Are they an attempt at idealism for the individual who's constantly trying to improve wit and intellect? Who knows? I DO know that idioms are fun to use, they elicit a giggle or two and most of all they lighten the mood of any conversation. Maybe that's the reason idioms are so widely loved and used! Please enjoy the following list of everyday idioms that I have compiled, with many more to come. I will first give you the idiom, then follow it up with it's actual meaning. Be prepared to smile! This does not mean you will need an umbrella sturdy enough to withstand animals dropping from the sky during a storm. It means a particularly heavy rain is falling. Do not be alarmed if you hear this, as it does not mean some poor soul has been born with ten thumbs! If someone is accused of being 'all thumbs', it means they are rather clumsy and unskilled. No one is going to look at you with their one blind eye or perform a turn with it in any direction. Rather it is the opposite. Turning a blind eye means to ignore something and to openly pretend it's not there. You can open your mouth without worrying as this does not mean someone will dive in if you leave it open. Jumping down someone's throat means lashing out with anger and unrestrained rage. You don't need a plumber to recover your drain-swallowed future intentions, but this does mean your plans have gone astray somehow. No, it is not Christmas just because your goose is cooked. Actually it is not a happy affair at all if this happens because it means you've been 'caught' doing something and will probably be in a heap of trouble because of it. Providing you know what a 'belfry' is, having bats in it doesn't mean you need to call the bat exterminator. Sorry, it's much worse than a few unwelcome bats flying around a bell tower if you are accused of this abomination, since it means you are slightly insane! Please don't expect your gatepost to begin chatting and sharing fencepost gossip with you and your friends. Gateposts don't talk and never will. This strange admission means the same as 'what happens in Vegas stays in Vegas'. It's all about keeping a secret. Your spare string, ribbons, thread, rope and anything else you like to tie things with are all safe, don't worry. To string someone along doesn't involve tying intricate knots in anything. It means you are bluffing someone in a personal plan and it's usually not a nice plan. Shame on you! Stop stressing out if you hear someone say this because it has nothing what-so-ever to do with learning and understanding another language. Again, like most idioms, it means the opposite. Saying something is Double Dutch or All Greek, means you cannot for the very life of you understand what someone is saying, and futhermore you don't really care.